The Auberge du Soleil offers a panoramic view of it's vineyards and the Napa Valley should you choose to get married on the terrace deck which has a stone sculpted fountain off to one side, and Terra Cotta pots filled with brilliantly colored annuals around the edges. 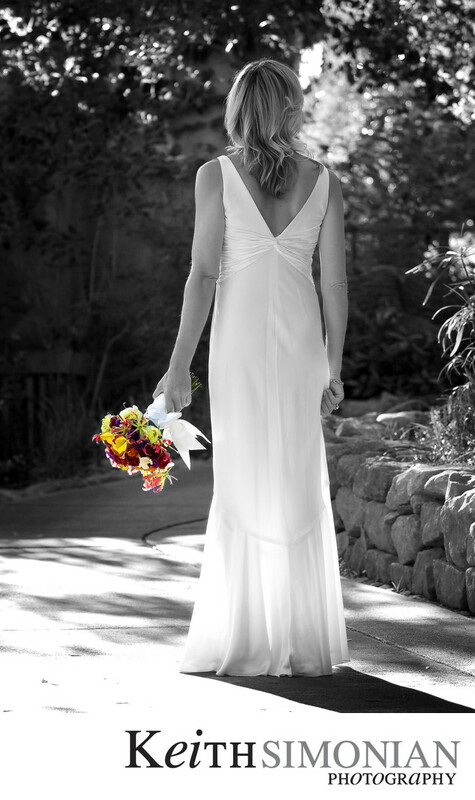 This selective color photo of the bride was made during her portrait session before the wedding. The "trick" of a selective color photo is to decide which part of the image should still retain color and which part should be converted to Black and White. Here only the bouquet is still in color while the dark greens of the plants in the background work wonderful for the black and white conversion. Location: Auberge du Soleil 180 Rutherford Hill Rd, Rutherford, CA 94573. 1/250; f/4.0; ISO 250; 108.0 mm.